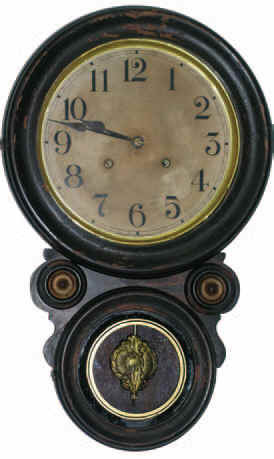 Waterbury Clock Co. hanging clock "Bahia", ca 1915. 22 inches high case has the original finish with crazing, some finish is worn off to base wood. 10 inches paper dial is in good original condition; hands, pendulum and glasses are old. The 8-day movement strikes half hour and hours on wire gong. Runs and strikes properly but would recommend servicing. Overall a nice original figure 8 wall clock. Ly- Waterbury No. 699.